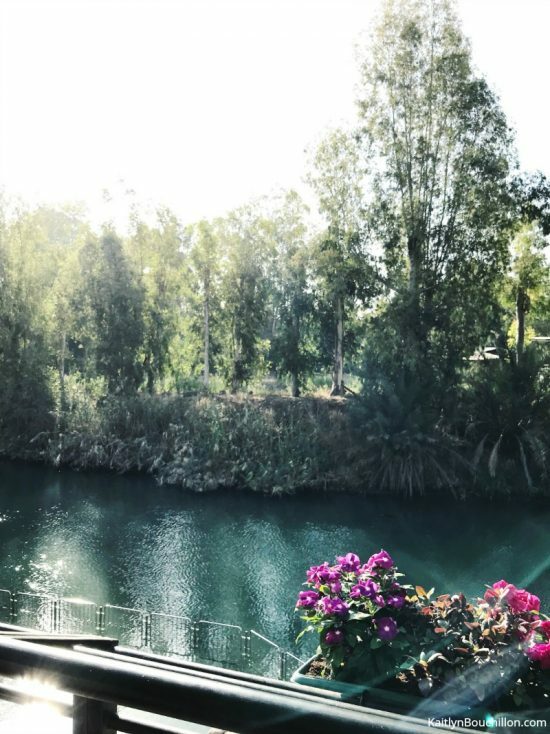 Slowly but surely, I’ve started sharing pictures and stories from Israel. After completely filling up Instagram Stories every day while we were there (I make no apologies, and also — big thanks to the hundreds of you who followed along and replied with excitement at the pictures and videos each day), I’m taking my time as I process what I’ve seen, heard, experienced and learned. I read once that traveling makes you speechless and then turns you into a storyteller. This is the Valley of Elah, the place where David fought Goliath. With a crowd watching and so much hanging in the balance, he remembered. He heard the mocking, took off the armor that didn’t fit, and he remembered. He knelt at the brook, chose five stones, and remembered. And then he ran. He remembered God’s faithfulness, His protection and provision in the past. He trusted God would go with him, that He would be enough. Just like we don’t know how one moment is preparing us for the next, I doubt David knew that his ordinary days of tending and watching and protecting his sheep would lead him to this valley. God was preparing him in one million regular moments, and every one of them mattered. Faithfully showing up in the seemingly mundane ordinary is extraordinary. It doesn’t always lead to a crowd, but it will shape and prepare us in ways we may not recognize until we’re on the other side of the valley. We don’t need to cover up who we are with someone else’s armor. We can simply kneel down, live the story we’ve been given, trust His goodness, and believe He goes with us. Let’s remember. And then let’s dare to run. I have a lot of very big feelings about this place, but very few words as I process and learn and observe. 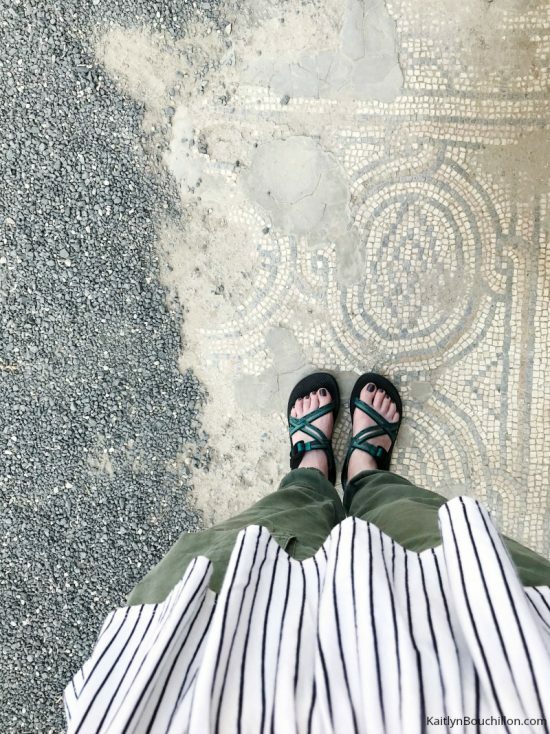 Walking where we’re as certain as we can be that Jesus walked, standing where we’re 99.9% sure He would have stood as He entered the synagogue… I just can’t with the words. I’m humbled and amazed and so very grateful. My thoughts ping pong between “this is incredible” and “oh my word” and my prayers are one long continuous string of “Thank You for coming. Thank You for coming.” What more is there to say? He came. He came to be with us, and He came for us. Jesus, thank You for coming. I’m not gonna lie, today was hard. I’ve had a horrible heat rash since day one, but the constant 100+ degree weather has turned it into swelling and blisters underneath today’s new sunburn. It’s beautiful and super comfortable (except not). The day ended in a lot of pain, and tomorrow will likely be more of the same, but as I sit here reflecting on each place we stopped and all I learned, I’m struck by the small moments that slipped through in between. Meaningful conversations, deep laughter, the way the sun hit the water, the smell of salt and sand that immediately made me think of home. A stone manger, frozen coffee, words for a book, flowers that are so bright and beautiful you’d swear they’ve been edited – except they’re real, right in front of you. And this. Coming back to this place, standing here where I was baptized and remembering every detail like it was yesterday. God meets us in the amazing and the difficult and the ordinary. He shows up in the seemingly small and it’s a straight up guarantee: if we look for Him, we’ll find Him. Every time. The water isn’t always calm, but there can always be Peace because He doesn’t just wait for us on the other side – He stays beside and carries us through. 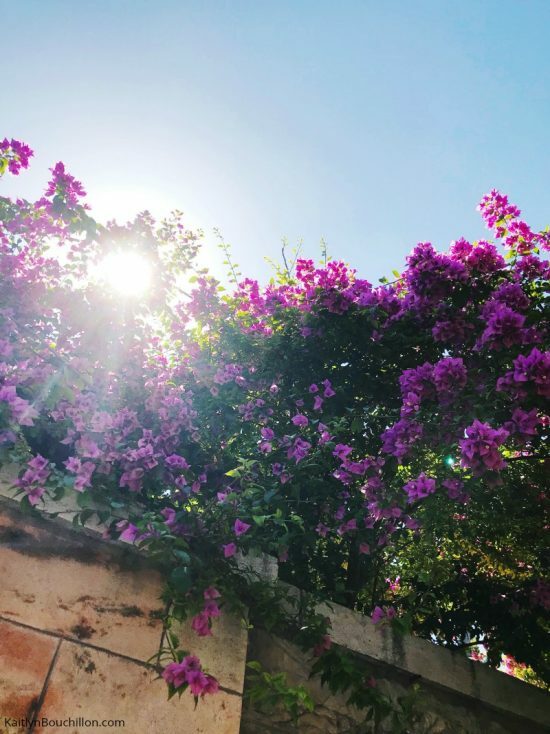 I’m finding it here too, on the other side of the world: beauty in the ordinary, new mercies each morning, and His faithfulness at every turn. 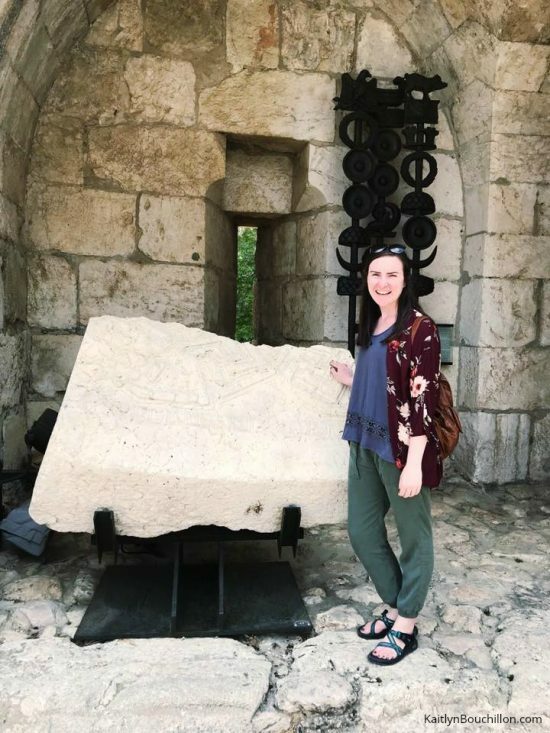 During my last semester of college, I researched and wrote (a lot) about Huldah – the prophetess in 2 Kings (and 2 Chronicles) who authenticates the book of Deuteronomy, urging King Josiah to follow and obey every word. The Huldah Gates are now filled in, but they used to be the southern entrance for common folk to enter the Temple Mount in Jerusalem. This intricately detailed (massive) piece of limestone was a small piece of the lintel. I know it may not look like much to you, and I can assure you no one else in our group took a similar picture right where I’m standing, but it means something to me. Because it’s pretty amazing when homework and history and faith all meet together in front of your eyes. Because it’s a picture of the Bible going from black and white to living color. Because it’s real. The Garden of Gethsemane is exploding with beauty and color and life. Because of course it is. All things made new, beauty from ashes, life from death… Out of darkness, light. Each of these glimpses into what I’m processing are images and captions from Instagram. There are others that I’ve posted (you can find them on Instagram and on my Facebook page), and I’ll continue to share more in the coming days and months — and, let’s be honest, years. Thank you for joining me as I traveled, thank you for your grace as this space remained quiet, and thank you for faithfully continuing to show up in this corner of the internet. I don’t take that for granted, and I pray that I’ll steward these stories well. After a few weeks away, I’m playing major catch-up with all the things, but there are several blog posts and stories burning inside. 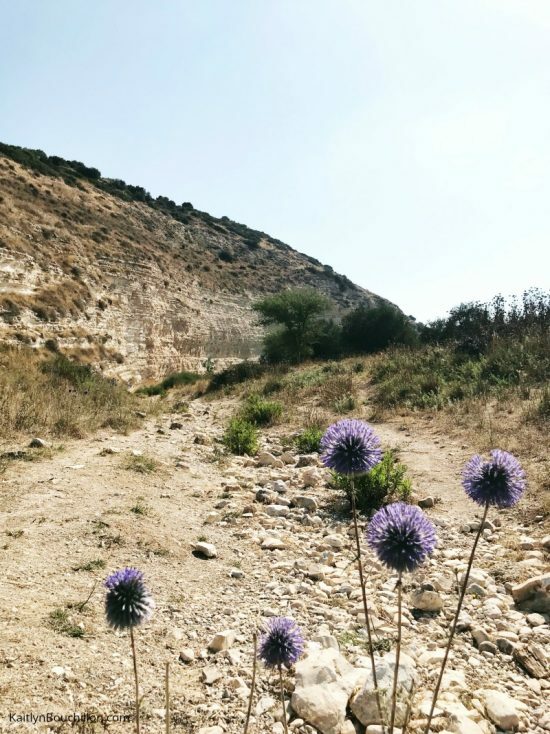 About Israel, about the beautiful ordinary that is our right now lives, about redemption, about waiting and hoping and watching the seasons change. Looks like it’s true… traveling makes you speechless, and then it turns you into a storyteller. Thank you, Sarah! I’m glad you’re on the team. :) Thanks for following along on IG stories and this post. Hi Kaitlyn, I have just started dreaming and planning my first trip to Israel. In the meantime, thank you so much for sharing yours! Hoping for you that you’ll be able to go one day! Enjoying your pictures form Israel. It would be awesome to go sometime but I am guessing I will have to live precariously through others! Thanks for sharing. I hope you’ll be able to go some day! I remember feeling similar where faith, study of the Word & reality met when I started working with Leprosy sufferers overseas. I too burn under a light bulb! Tea With Jennifer recently posted…Dreams…. Hello! I found your blog via Holley Gerth’s linkup today, and I’m so glad I did. Thank you for sharing and I look forward to learning more about you, your trip and seeing more beautiful pictures. Blessings! WOW! So glad you got to go there and see and dwell in those places that we read about. Your words push me to dwell with you for a brief moment too. I love the way you describe the Garden of Gethsemane…full of life..of course it is…etc. It really is! I think I will poke my head in at your Instagram too. Thank you for visiting here today, Linda! Hope we can connect on Instagram.